Will Power (Team Penske) finally wins the Indianapolis 500 in the eleventh attempt at the greatest American race. Until today, he had the 2014 IndyCar Series title and 33 IndyCar race victories but he was missing the most important of all wins. And he finally gets it. This is Power’s second win this year after he won the previous round at Indianapolis Motor Speedway’s road course. He became the first Australian to win the Indianapolis 500. His victory is 17th for Team Penske. The driver of the #12 Verizon Dallara DW12-Chevrolet triumphed ahead of pole-sitter Ed Carpenter in the #20 ECR Chevrolet and Scott Dixon in the #9 Chip Ganassi Racing Honda. 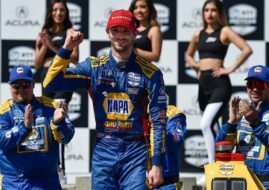 Last year’s Indy 500 winner Alexander Rossi (Andretti Autosport) progressed from the 32nd place on the grid to fourth. His teammate Ryan Hunter-Reay completed the top 5. Simon Pagenaud, Carlos Munoz, Josef Newgarden, Robert Wickens and Graham Rahal take positions from P6 to P10. Eighteen drivers completed all 200 laps, twenty-four drivers were running at chequered flag.